After a long Utah winter that saw me unexpectedly putting hundreds of miles on my Altra Lone Peak Neoshell, the weather finally changed and I’ve been able to get a full lifetime out of my Altra Olympus 2.0. 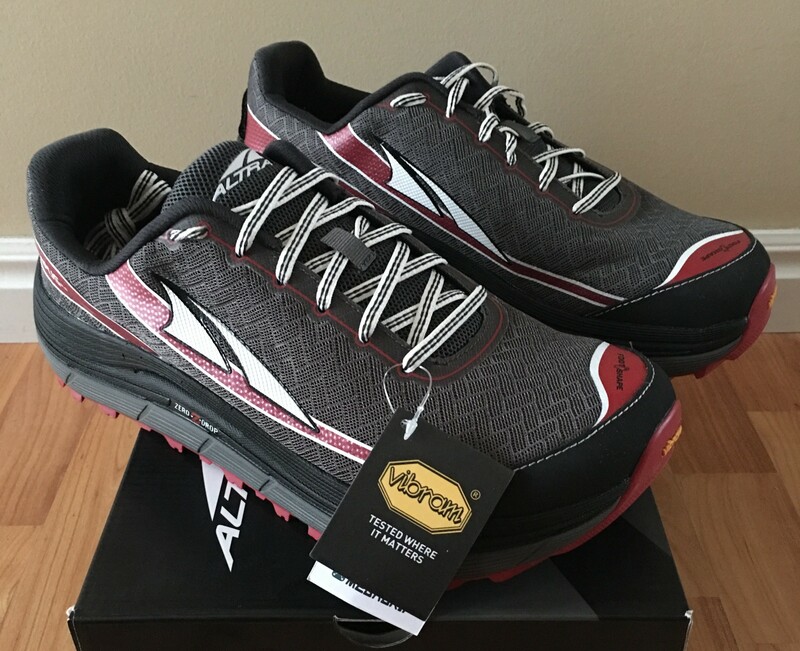 If you haven’t had a chance, feel free to check out my first impressions of the Altra Olympus 2.0 and then come back here for the full review. Altra shoes tend to get a lot of attention due to their color choices, sometimes good and sometimes questionable. The Olympus line has always had fairly decent color choices and I’m pretty happy with the options for the Altra Olympus 2.0. For men, they are available in Blue Iris/Lime, Pewter/Racing Red, and Silver/Cyber Yellow. For the ladies, the available options are Orchid/Gray, Shiitake/Sugar Coral, and Silver/Green. Across the board I think these are all great colorways and wouldn’t mind any of them personally. My pair happens to be Pewter/Racing Red which is my favorite of the bunch. Altra has historically had a lot of challenges with sizing consistency between models and versions, but it seems like with each generation they’ve been getting better and better about sizing. Like every other pair of Altras, I wear a size 10.5 in these and they fit me perfectly. 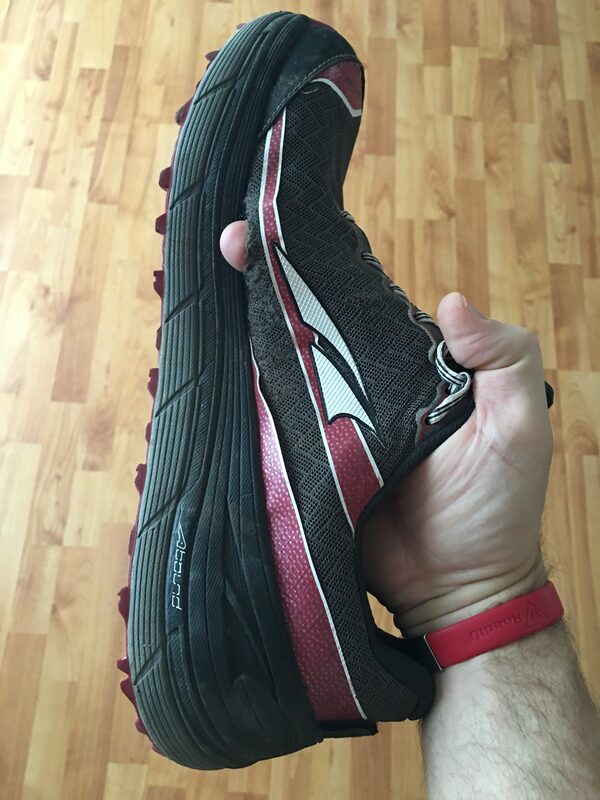 I did have some initial concerns about heel slippage during my first run, but after adjusting the lacing and going on a few runs, any heel slippage issues were resolved and I never had any further sizing or fit issues with my pair of Altra Olympus 2.0. If you are an Altra wearer, I would get these in the same size you already wear. 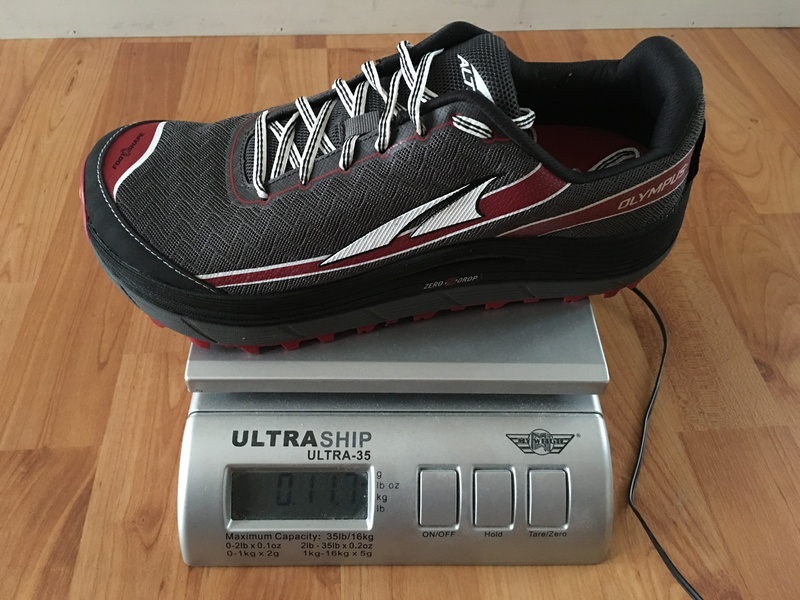 If you are new to Altra, or want a second opinion, I’d recommend heading over to Amazon and clicking the Find the right size button which uses the shoefitr technology Amazon acquired that lets you compare the fit of the Altra Olympus 2.0 shoe to whatever other shoe you currently wear to give you the best recommendation. You can read more about my initial impressions from my first run in my previous post here. Purely a cosmetic issue, and it’s quite possible this was an early production issue since I haven’t seen another case of it, but the graphics on one shoe peeled off almost completely within the first 3 runs on the shoes. The bigger issue, one that I’ve seen many people have within my circle of running friends and on various online running groups, is the durability of the toe box material. My pair of Altra Olympus 2.0 lasted just about 300 miles before they “blew out” and from what I can tell I managed to get more miles than most other people who had the same issue. Most shoe manufacturers will tell you their shoes should be replaced every 300-500 miles so this isn’t egregious, but it’s certainly a lot fewer miles than I’ve managed to squeeze out of every other pair of Altra including my Lone Peak 2.5 that had a similar issue at 500 miles. On the positive side, the new Vibram Megagrip outsole held up phenomenally well over the course of 300 miles of mixed road and trail, and aside from a spot on the heel that I have a tendency to drag, the outsole looks almost brand new and maintained it’s traction on all surfaces throughout the life of the shoe. The first two generations of the Altra Olympus were not my favorite shoes, and for the most part I tolerated them simply because of the max cushioning that came in handy on recovery days. The newest generation has completely changed my mind about the shoe though and I found myself grabbing the Altra Olympus 2.0 more often than my Lone Peaks. I even ran the Gorge Waterfalls 100k in them without ever changing shoes. They turned out to be the perfect shoe for the varying conditions thanks to the new Vibram Megagrip outsole and for the distance thanks to the max cushioning. I think Altra has definitely moved in the right direction with the Altra Olympus 2.0 and I’m very excited to see what improvements they make in the next version. The durability issues are concerning, but Altra has great customer support and has been known to replace shoes or provide 50% off discounts for replacement shoes, so I wouldn’t let the durability issues prevent you from trying out this great shoe. I continue to run in these shoes despite the side wall tearing apart in the hopes that I can squeeze as many miles as possible out of them. Have you tried out the new Altra Olympus 2.0? Let me know your thoughts in the comments below. I sell Altra’s for a living along with various other running shoes. Although the Olympus 2.0 is lighter, has better traction, and ultimately has better features to perform well on trail, I still sell quite a few of the Olympus 1.5. There is more volume in the 1.5 and fits insanely wide feet. Also, the rocker in the 1.5 alleviates a ton of foot pain from plantar fasciitis to metatarsalgia. I’m sad to see the 1.5 go and feel like it had a great place for customers in my shop. That’s an interesting perspective, thanks for chiming in. I have 4E width feet (can’t get much wider) and while the Olympus 1.0 and 1.5 do have more volume, I don’t find the 2.0 to be restrictive at all. In fact, I find them to be more re-assuring than the older models on technical trails, maybe because they are a little more snug on my feet. Thanks for the review. I may need to give Altras another shot. Unfortunately I have had trouble wearing their size 13 in the past . It seemed like while the forefoot was nice and wide the length was less than the standard. If they made a 13 1/2 I would probably be fine. I tried a 14 and it was too sloppy. I deal with neuromas in my forefoot so the width would be nice. For now I’ll probably go with the Bondi 2E and see how that works. Thanks for the comment. Altra has gotten better with sizing with each iteration so I’d definitely give them another try. The Olympus 2.0 has become my favorite racing shoe thanks to the fit, cushioning, and Vibram outsole. I want to try Altus for trail running, including technical elements such as rocks, roots and muds and for long-distance (50+ kms). I use Hoka One One Clifton for daily running and I like them. Lone Peak or Olympus, which one would you think I should try? Both the Lone Peak and Olympus are great shoes, but I prefer the Vibram outsole of the Olympus for mixed conditions and for long distance cushioning. I prefer the Lone Peak for shorter (up to 50k) efforts. Great guidance, thanks! I will give Olympus a try. Looking forward for my first Altra. I find the stack height way too high on the Hokas causing a sense of instability and ankle rolls unless I’m running on flat surfaces. (The exception was the Speedgoat, but they were too narrow.) I’m hesitant to try the Olympus 2.0 because of the same issue. What do you think? I haven’t run in Hokas (too narrow for me) but they tend to have similar or less stack height than the Olympus so I’m guessing you might experience similar issues. Admittedly, I’ve had my share of ankle rolls as well in the Olympus but have also had them in thinner shoes like the Lone Peak as well. Altra has a 30-day return policy, so it might be worth trying them out for yourself to see if you have problems and if so, return them. Thanks, Ryan. I did not know about the return policy. Might be worth a shot. Thanks. Funny. Had my 1st 100K last weekend and experienced some toe pain. Found out this week that I was a late entry into another 100K that I wasn’t expecting, so here I am searching for reviews on this shoe because I’m thinking of giving Altra a shot – when lo and behold, you mention the exact race (Gorge Waterfalls 100K) that I’m now prepping for! Glad to hear it handled the terrain; just ordered myself a pair & I’m hoping they’ll work out. My 2nd pair. Both have failed in the heel “collar” in under 100 miles. Heel collar tears too easily. When I reported to altra they claim user error and suggested I tie the shoes tighter. Ive never had this problem with a Hoka that I just retired at 375 miles. I’m sorry to hear that Alex. I’ve never had that particular failure with the Olympus, although I’ve always used the heel lock lacing method that Altra recommends on all my running shoes.